Saxagliptin intermediate CAS; 361440-67-7 is the second step in synthesis, it is not only a basic intermediate in synthetic but also very more crucial intermediates. The market scale of production are mostly gram and kilogram class, our products can do this more than 100 kilograms scale. Product quality reference purity NLT 98%, the actual test result is NLT 98.5% and We can provide 25 g sample for sample test, other quantity package according to the actual needs. Saxagliptin intermediate CAS 361440-67 -7 is a white or off-white solid powder with the molecular formula of C11H18N2O3. 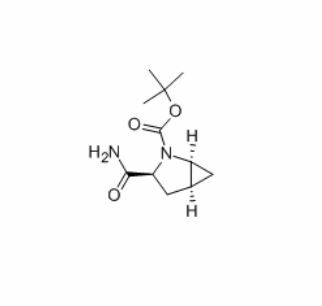 (1S,3S,5S) -3-(Aminocarbonyl)-2-azabicyclo[3.1.0]hexane-2-carboxylic acid tert-butyl ester 361440-67-7 is a Pharmaceutical intermediate ,which is used in the synthesis of Saxagliptin. After the order confirmation, we will share HPLC. we offered with high purity is worthy of your trust. Looking for ideal White Powder Saxagliptin Intermediate CAS 361440-67-7 Manufacturer & supplier ? We have a wide selection at great prices to help you get creative. All the Saxagliptin Intermediate CAS 361440-67-7 are quality guaranteed. We are China Origin Factory of 361440-67-7. If you have any question, please feel free to contact us.